This has been a brutally cold winter in many parts of the country, and furnaces from Maine all the way down to Florida have been working overtime. Having your furnace fail unexpectedly can be traumatic, leading to a night huddled under blankets, frozen and burst pipes, and even deadly house fires caused by using unsafe backup heating. It can also be traumatic for your wallet; HomeAdvisor puts the cost of a new furnace as high as $6,045, and repairs and part replacements can run up to $1,200. You might think having the furnace go out is out of your control. Sure, it could be bad luck, or the furnace might just be at the end of its life span. Or, you might be hastening its demise by doing one of these things. If you didn't call your local HVAC company to check out your furnace at the beginning of the season, do it now (or inspect it yourself; Angie's List has DIY tips). The main things to check are that the furnace is getting power, and that nothing is blocking the fresh air intake and exhaust. Running the furnace with these parts compromised could lead to a larger repair bill down the road, or worse, danger to the people in your home. Experts say you should also periodically make sure the filter is securely in place and dust the area around it. If you run the furnace on a dirty filter, you are compromising your indoor air quality, and you're also making the furnace work harder, potentially shortening its life. The less you run your furnace, the longer it (and its component parts) will last. You may not be able to control the temperature outside, but you can control your thermostat. One way to reduce how much the furnace runs is to turn down the temperature when you are out of the house or sleeping. 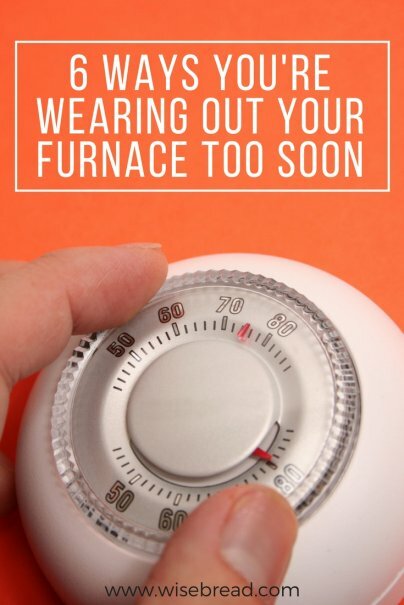 My family sets the nighttime temperature to 60 degrees, and since we live in a moderate climate, that means that the furnace usually doesn't kick in at all at night. We have lots of blankets on our beds, and we find that we sleep better in cooler air and without the dryness and sound of the furnace blowing. If you have trouble remembering to turn down the heat before you leave or go to bed, get a programmable thermostat or a learning thermostat like the Nest Learning Thermostat. Even if you work from home, you may be able to set the thermostat lower during your workday, since you are probably spending most of your time sitting in one place. Space heaters, electric blankets, heating pads, or even a kitty in your lap can help keep your home office or even just your desk chair cozy. Your dad said it best: "I'm not paying to heat the whole neighborhood!" If you leave the doors and windows open, or if your home doesn't have adequate insulation, the furnace is working harder than it needs to maintain the indoor temperature. Do your furnace — and your wallet — a favor and bundle up your house with additional insulation, higher-rated windows, and anything else you can do to keep the warm air in. We've all done it; you come home and the house is cold, so you set it to 80, hoping it wil warm the house up faster. The reality is, if you want your house to be 70 degrees, setting it to 80 won't get you there any faster. What it will do is force the furnace to keep running once it's achieved 70 degrees, leading to an overheated house and unnecessary wear and tear on the heater. As a frugalista, I have often closed vents in unused rooms to save on heat. Little did I know I may have been wearing out or even damaging my furnace! It turns out, HVAC systems are set up to achieve optimal air pressure to heat the whole house. When you close vents, you raise the pressure in the system, forcing the blower to work harder, and wearing it out faster. The imbalance can even cause the heat exchanger to crack. Not only is this more costly in the long term, it's probably not even saving money in the short term, since closing vents can increase energy use rather than reducing it. If you really want to heat only certain areas of your home, look into getting a zoned system.Placing furniture and rugs over vents can cause the same problems. If you have to place furniture over a vent, use a deflector to route the air away from it.